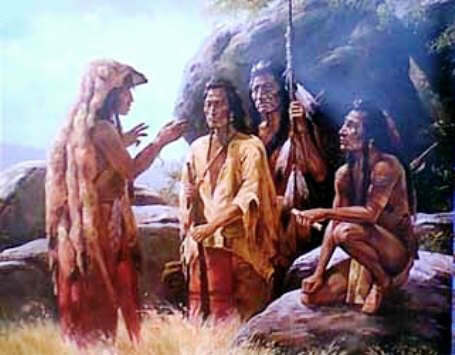 As the children whose ancestors came from Europe have stories about the heroes who killed wicked and cruel monsters—like Jack the Giant Killer, for example—so the Indian children hear stories about persons who had magic power and who went about the world destroying those who treated cruelly or killed the Indians of the camps. Such a hero was Kut-o-yis', and this is how he came to be alive and to travel about from place to place, helping the people and destroying their enemies. It was long, long ago, down where Two Medicine and Badger Rivers come together, that an old man lived with his wife and three daughters. One day there came to his camp a young man, good-looking, a good hunter, and brave. He stayed in the camp for some time, and whenever he went hunting he killed game and brought in great loads of meat. All this time the old man was watching him, for he said in his heart, "This seems a good young man and a good hunter. Perhaps I will give him my daughters for wives, and then he will stay here and help me always." After a time the old man decided to do this, and he gave the young man his daughters; and because these three were his only children he gave his son-in-law his dogs and all his property, and for himself and his wife he kept only a little lodge. The young man's wives tanned plenty of cow skins and made a big fine lodge, and in this the son-in-law lived with his wives. For some time after this the son-in-law was very good and kind to the old people. When he killed any animal he gave them part of the meat, and gave them skins which his mother-in-law tanned for robes or for clothing. As time went on the son-in-law began to grow stingy, and pretty soon he gave nothing to his father-in-law's lodge, but kept everything for his own. Now, the son-in-law was a person of much mysterious power, and he kept the buffalo hidden under a big log-jam in the river. Whenever he needed food and wished to kill anything, he would take his father-in-law with him to help. He would send the old man out to stamp on the log-jam and frighten the buffalo, and when they ran out from under it the young man would shoot one or two with his arrows, never killing more than he needed. But often he gave the old people nothing at all to eat. They were hungry all the time, and at length they began to grow thin and weak. One morning early the young man asked his father-in-law to come and hunt with him. They went to the log-jam and the old man drove out the buffalo and his son-in-law killed a fat buffalo cow. Then he said to his father-in-law, "Hurry back now to the camp and tell your daughters to come and carry home the meat, and then you can have something to eat." The old man set out for the camp, thinking, as he walked along, "Now, at last, my son-in-law has taken pity on me; he will give me some of this meat." When he returned with his daughters they skinned the cow and cut it up and, carrying it, wept home. The young man had his wives leave the meat at his own lodge and told his father-in-law to go home. He did not give him even a little piece of the meat. The two older daughters gave their parents nothing to eat, but sometimes the youngest one had pity on them and took a piece of meat and, when she could, threw it into the lodge to the old people. The son-in-law had told his wives not to give the old people anything to eat. Except for the good heart of the youngest daughter they would have died of hunger. Another day the son-in-law rose early in the morning and went over to the old man's lodge and kicked against the poles, calling to him, "Get up now and help me; I want you to go and stamp on the log-jam to drive out the buffalo." When the old man moved his feet on the jam and a buffalo ran out, the son-in-law was not ready for it, and it passed by him before he shot the arrow; so he only wounded it. It ran away, but at last it fell down and died. The old man followed close after it, and as he ran along he came to a place where a great clot of blood had fallen from the buffalo's wound. When he came to where this clot of blood was lying on the ground, he stumbled and fell and spilled his arrows out of his quiver, and while he was picking them up he picked up also the clot of blood and hid it in his quiver. "What are you picking up?" called the son-in-law. "Nothing," replied the old man. "I fell down and spilled my arrows, and I am putting them back." "Ah, old man," said the son-in-law, "you are lazy and useless. You no longer help me. Go back now to the camp and tell your daughters to come down here and help carry in this meat." The old man went to the camp and told his daughters of the meat that their husband had killed, and they went down to the killing ground. Then he went to his own lodge and said to his wife, "Hurry, now, put the stone kettle on the fire. I have brought home something from the killing." "Ah," said the old woman, "has our son-in-law been generous and given us something nice to eat?" "No," replied the old man, "but hurry and put the kettle on the fire. After a time the water began to boil and the old man turned his quiver upside down over the pot, and immediately there came from it a sound of a child crying, as if it were being hurt. The old people both looked in the kettle and there they saw a little boy, and they quickly took him out of the water. They were surprised and did not know where the child had come from. The old woman wrapped the child up and wound a line about its wrappings to keep them in place, making a lashing for the child. Then they talked about it, wondering what should be done with it. They thought that if their son-in-law knew it was a boy he would kill it; so they determined to tell their daughters that the baby was a girl, for then their son-in-law would think that he was going to have another wife. So he would be glad. They called the child Kut-o-yis'—Clot of Blood. The son-in-law and his wives came home, bringing the meat, and after a little time they heard the child in the next lodge crying. The son-in-law said to his youngest wife, "Go over to your mother's and see whether that baby is a boy or a girl. If it is a boy, tell your parents to kill it." Soon the young woman came back and said to her husband, "It is a girl baby. You are to have another wife." The son-in-law did not know whether to believe this, and sent his oldest wife to ask the same question. When she came back and told him the same thing he believed that it was really a girl. Then he was glad, for he said to himself, "Now, when this child has grown up, I shall have another wife." He said to his youngest wife, "Take some back fat and pemmican over to your mother; she must be well fed now that she has to nurse this child." On the fourth day after he had been born the child spoke and said to his mother, "Hold me in turn to each one of these lodge poles, and when I come to the last one I shall fall out of my lashings and be grown up." The old woman did as he had said, and as she held him to one pole after another he could be seen to grow; and finally when he was held to the last pole he was a man. After Kut-o-yis' had looked about the lodge he put his eye to a hole in the lodge-covering and looked out. Then he turned around and said to the old people, "How is it that in this lodge there is nothing to eat? Over by the other lodge I see plenty of food hanging up." "Hush," said the old woman, raising her hand, "you will be heard. Our son-in-law lives over there. He does not give us anything at all to eat." "Well," said the young man, "where is your piskun—where do you kill buffalo?" "It is down by the river," the old woman answered. "We pound on it and the buffalo run out." For some time they talked together and the old man told Kut-o-yis' how his son-in-law had abused him. He said to the young man, "He has taken from me my bow and my arrows and has taken even my dogs; and now for many days we have had nothing to eat, except sometimes a small piece of meat that our daughter throws to us." "Father," said Kut-o-yis', "have you no arrows?" "No, my son," replied the old man, "but I still have four stone arrow points." "Go out then," said Kut-o-yis', "and get some wood. We will make a bow and some arrows, and in the morning we will go down to where the buffalo are and kill something to eat." Early in the morning Kut-o-yls' pushed the old man and said, "Come, get up now, and we will go down and kill, when the buffalo come out." It was still very early in the morning. When they reached the river the old man said, "This is the place to stand and shoot. I will go down and drive them out." He went down and stamped on the log-jam, and presently a fat cow ran out and Kut-o-yis' killed it. Now, after these two had gone to the river the son-in-law arose and went over to the old man's lodge, and knocked on the poles and called to the old man to get up and help him kill. The old woman called out to the son-in-law, saying, "Your father-in-law has already gone down to the piskun." This made the son-in-law angry, and he began to talk badly to the old woman and to threaten to harm her. Presently he went on down to the log-jam, and as he got near the place he saw the old man at work there, bending over, skinning a buffalo; for Kut-o-yis', when he had seen the son-in-law coming, had lain down on the ground and hidden himself behind the carcass. When the son-in-law had come pretty close to where the buffalo lay he said to his father-in-law, "Old man, stand up and look all about you. Look carefully and well, for it will be the last time that you will ever see anything"; and while the son-in-law said this he took an arrow from his quiver. Kut-o-yis' spoke to the old man from his hiding-place and said, "Tell your son-in-law that he must take his last look, for that you are going to kill him now." The old man said this as he had been told. "Ah," said the son-in-law, "you talk back to me. That makes me still angrier at you." He put an arrow on the string and shot at the old man, but did not hit him. Kut-o-yis' said to the old man, "Pick up that arrow and shoot it back at him"; and the old man did so. Now, they shot at each other four times, and then the old man said to Kut-o-yis', "I am afraid now; get up and help me. If you do not, I think he will kill me." Then Kut-o-yis' rose to his feet and said to the son-in-law, "Here, what are you doing? I think you have been treating this old man badly for a long time. Why do you do it?" "Oh no," said the son-in-law, and he smiled at Kut-o-yis' in a friendly way, for he was afraid of him. "Oh no; no one thinks more of this old man than I do. I have always been very good to him." "No," said Kut-o-yis'. "You are saying what is not true, and I am going to kill you now." Kut-o-yis' shot the son-in-law four times and he fell down and died. Then the young man told his father to go and bring down to him the daughters who had acted badly toward him. The old man did so and Kut-o-yis' punished them. Then he went up to the lodges and said to the youngest woman, "Did you love your husband?" "Yes," said the girl, "I loved him." So Kut-o-yis' punished her too, but not so badly as he had the other daughters, because she had been kind to her parents. To the old people he said, "Go over now to that lodge and live there. There is plenty of food, and when that is gone I will kill more. As for me, I shall make a journey. Tell me where there are any people. In what direction shall I go to find a camp?" "Well," said the old man, "up here on Two Medicine Lodge Creek there are some people—up where the piskun is, you know." Kut-o-yis' followed up the stream to where the piskun was and there found many lodges of people. In the centre of the camp was a big lodge, and painted on it the figure of a bear. He did not go to this lodge, but went into a small lodge where two old women lived. When he had sat down they put food before him—lean dried meat and some belly fat. "How is this, grandmothers?" he said. "Here is a camp with plenty of fat meat and back fat hanging up to dry; why do you not give me some of that?" "Hush; be careful," said the old women. "In that big lodge over there lives a big bear and his wives and children. He takes all the best food and leaves us nothing. He is the chief of this place." Early in the morning Kut-o-yis' said to the old women, "Harness up your dogs to the travois now and go over to the piskun, and I will kill some fat meat for you." When they got there, he killed a fat cow and helped the old women to cut it up, and they took it to the lodge. One of those old women said, "Ah me, the bears will be sure to come." They said to him, "We shall be sorry to lose this back fat." "Do not fear," he said. "No one shall take this back fat from you. Now, take all those best pieces and hang them up, so that those who live in the bear lodge may see them." They did so. Pretty soon the old bear chief said to one of his children, "By this time I think the people have finished killing. Go out now and look about; see where the nicest pieces are, and bring in some nice back fat." One of the young bears went out of the lodge and stood up and looked about, and when it saw this meat hanging by the old women's lodge close by, it went over toward it. "Ah," said the old women, "there are those bears." "Do not be afraid," said Kut-o-yis'. The young bear went over to where the meat was hanging and stood up and began to pull it down. Kut-o-yis' went out of the lodge and said, "Wait; wait! What are you doing, taking the old women's meat?" The young bear answered, "My father told me that I should go out and get this meat and bring it home to him." Kut-o-yis' hit the young bear over the head with a stick and it ran home crying. When it had reached the lodge it told what had happened and the father bear said, "I will go over there myself; perhaps this person will hit me over the head." When the old women saw the father and mother bear and all their relations coming they were afraid, but Kut-o-yis' jumped out of the lodge and killed the bears one after another; all except one little she-bear, a very small one, which got away. "Well," said Kut-o-yis', "you may go and breed more bears." He told the old women to move over to the bear-painted lodge and after this to live in it. It was theirs. To the old women Kut-o-yis' then said, "Now, grandmothers, where are there any more people? I want to travel about and see them." The old women said, "At the Point of Rocks —on Sun River—there is a camp. There is a piskun there." So Kut-o-yis' set off for that place, and when he came to the camp he went into an old woman's lodge. The old woman gave him something to eat—a dish of bad food. "Why is this, grandmother?" asked Kut-o-yis'. "Have you no food better than this to give to a visitor? Down there I see a piskun; you must kill plenty of buffalo and must have good food." "Speak lower," said the old woman, "or you may be heard. We have no good food because there is a great snake here who is the chief of the camp. He takes all the best pieces. He lives over there in that snake-painted lodge." The next morning when the buffalo were led in, Kut-o-yis' killed one, and they took the back fat and carried it to their lodge. Then Kut-o-yis' said, "I think I will visit that snake per-son." He went over and went into the lodge, and there he saw many women that the snake person had taken to be his wives. The women were cooking some service berries. Kut-o-yis' picked up the dish and ate the berries and threw the dish away. Then he went up to the big snake, who was lying there asleep, and pricked him with his knife, saying, "Here, get up; I have come to visit you. Let us smoke together." Then the snake was angry and he raised up his head and began to rattle, and Kut-o-yis' cut off his head and cut him in pieces. He cut off the heads of all the snake's wives and children; all except one little female snake which got away by crawling into a crack in the rocks. "Oh, well," said Kut-o-yis', "you can go and breed snakes so there will be more. The people will not be afraid of little snakes." Kut-o-yis' said to the old woman, "Now, grandmother, go into this snake lodge and take it for your own and everything that is in it." Then he said to them, "Where are there some more people?" They told him there were some camps down the river and some up in the mountains, but they said, "Do not go up there. It is bad because there lives Ai-sin'-o-ko-ki—Wind Sucker. He will kill you." Kut-o-yis' was glad to know that there was such a person, and he went to the mountains. When he reached the place where Wind Sucker lived, he looked into his mouth and saw there many dead people. Some were skeletons and some had only just died. He went in, and there he saw a fearful sight. The ground was white as snow with the bones of those who had died. There were bodies with flesh on them; some who had died not long before and some who were still living. As he looked about, he saw hanging down above him a great thing that seemed to move—to grow a little larger and then to grow a little smaller. Kut-o-yis' spoke to one of the people who was alive and asked, "What is that hanging down above us?" The person answered him, "That is Wind Sucker's heart." Then Kut-o-yis' spoke to all the living and said to them, "You who still draw a little breath try to move your heads in time to the song that I shall sing; and you who are still able to move stand up on your feet and dance. Take courage now; we are going to dance to the ghosts." Then Kut-o-yis' tied his knife, point upward, to the top of his head and began to dance, singing the ghost song, and all the others danced with him; and as he danced up and down he kept springing higher and higher into the air, and the point of his knife cut Wind Sucker's heart and killed him. Then Kut-o-yis', with his knife, cut a hole between Wind Sucker's ribs, and he and all those who were able to move crawled out through the hole. He said to those who could still walk that they should go and tell their people to come here, to get the ones still alive but unable to travel. To some of these people that he had freed he said, "Where are there any other people? I want to visit all the people." "There is a camp to the westward, up the river," they replied; "but you must not take the left-hand trail going up because on that trail lives a woman who invites men to wrestle with her and then kills them. Avoid her." Now, really, this was what Kut-o-yis' was looking for. This was what he was doing in the world, trying to kill off all the bad things. He, asked these people just where this woman lived and how it was best for him to go so that he should not meet her. He did this because he did not wish the people to know that he was going where she was. He started, and after he had travelled some time he saw a woman standing not far from the trail. She called to him, saying, "Come here, young man, come here; I want to wrestle with you." "No," he replied, "I am in a hurry; I can-not stop." The woman called again, "No, no; do not go on; come now and wrestle once with me." After she had called him the fourth time, Kut-o-yis' went to her. Now on the ground where this woman wrestled with people she had placed many sharp, broken flint-stones, partly hiding them by the grass. The two seized each other and began to wrestle over these sharp stones, but Kut-o-yis' looked at the ground and did not step on them. He watched his chance and gave the woman a quick wrench, and threw her down on a, large sharp flint which cut her in two; and the parts of her body fell asunder. Kut-o-yis' then went on, and after a time came to where a woman had made a place for sliding downhill. At the far end of it she had fixed a rope which, when she raised it, would trip people up, and when they were tripped they fell over a high cliff into a deep water, where a great fish ate them. When this woman saw Kut-o-yis' coming she cried out to him, "Come over here, young man, and slide with me." "No," he replied, "I am in a hurry; I cannot wait." She kept calling to him, and when she had called him the fourth time he went over where he was to slide with her. "This sliding," said the woman, "is very good fun." "Ah, yes," said Kut-o-yis', "I will look at it." As he went near the place he looked carefully and saw the hidden rope. He began to slide, and holding his knife in his hand, when he reached the rope he cut it just as the woman raised it and pulled on it, and the woman fell over backward into the water and was eaten up by the big fish. From here he went on again, and after a time he came to a big camp. A man-eater was the chief of this place. Before Kut-o-yis' went to the chief's lodge he looked about and saw a little girl and called her to him and said, "Child, I am going into that lodge, to let that man-eater kill and eat me. Therefore, be on the watch, and if you can get hold of one of my bones take it out and call all the dogs to you, and when they have come to you throw down the bone and say, Kut-o-yis', the dogs are eating your bones." Then Kut-o-yis' entered the lodge, and when the man-eater saw him he called out, "Oki, oki!" (welcome, welcome!) and seemed glad to see him, for he was a fat young man. The man-eater took a knife and walked up to Kut-o-yis' and cut his throat and put him into a great stone pot to cook. When the meat was cooked he pulled the kettle from the fire and ate the body, limb by limb, until it was all eaten. After that the little girl who was watching came into the lodge and said, "Pity me, man-eater, my mother is hungry and asks you for those bones." The old man gathered them together and handed them to her, and she took them out of the lodge. When she had gone a little way, she called all the dogs to her and threw down the bones to the dogs, crying out, "Look out, Kut-o-yis', the dogs are eating you," and when she said that, Kut-o-yis' arose from the pile of bones. Again he went into the lodge, and when the man-eater saw him he cried out, "How, how, how! the fat young man has survived!" and he seemed surprised. Again he took his knife and cut the throat of Kut-o-yis' and threw him into the kettle. Again when the meat was cooked he ate it, and when the little girl asked for the bones again he gave them to her. She took them out and threw them to the dogs, crying, "Kut-o-yis', the dogs are eating you," and again Kut-o-yis' arose from the bones. When the man-eater had cooked him four times Kut-o-yis' again went into the lodge, and seizing the man-eater, he threw him into the boiling kettle, and his wives and all his children, and boiled them to death. The man-eater was the seventh and last of the bad things to be destroyed by Kut-o-yis'.